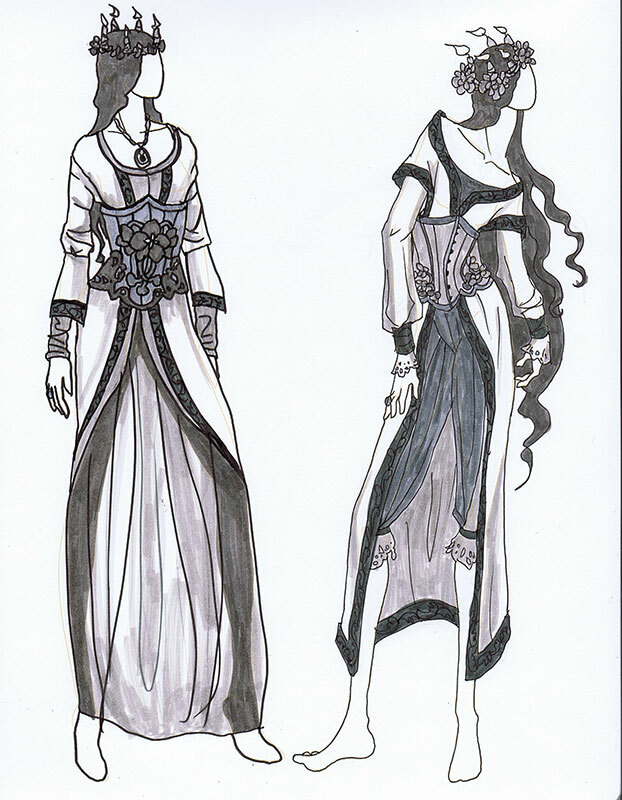 In the last Sketch Diary, I made decisions about the narrative elements and wardrobe. I still haven’t left Photoshop while I gather reference and photo bash them in where needed. This helps me get a more realistic grounded base for elements like the hair, candles, etc. I use anything that’s useful. For instance, the hair comes from bits of someone’s bangs and at least four different photos of hair. The main pose comes from a set of stock photos I shot myself, which are available for other artists to use here. These photos are just a guideline and are changed later to suit my needs. I also made a last minute change to her right hand (on our left). The original hand wasn’t elegant enough, so I took a quick photo with my webcam to replace the hand with fingers that are more interesting. The ankles and waist have also been thinned. Next up, I do a digital color test! That’s right, I still haven’t left the prep phase. After exploring different options, I find that I like 3 the best. The Lady’s silhouette is the clearest since the warm colors push her forward from the cool background and I like the way the purple and yellow play off of one another in a complementary scheme. This is the last peek at Lady of February before I move on to putting paint on paper! 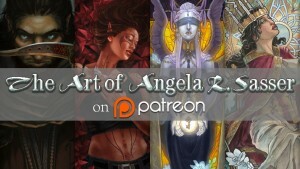 If you like this series and want to help support me while I create the Ladies of the Months, check out the Ladies’ Patreon page! the ability to pre-order Limited Edition items, and more! The more Pledges I get, the more Rewards that will unlock for everyone! Last Sketch Diary, I talked about the research and design process. Now, I’m diving into all the lovely details that make up the character and the mythos around her. Before I could move on with this piece, I had to make a decision about the pose. I ended up choosing pose 3 because I like the playfulness of it. 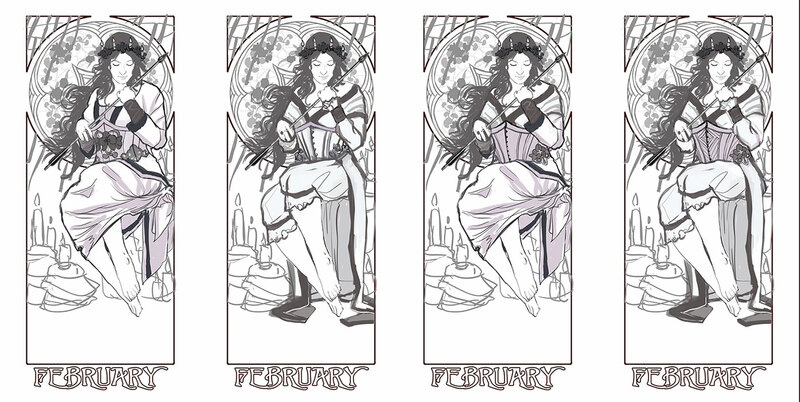 The other poses were too assertive or too tragic looking when February is meant to be more welcoming and playful. The subtle smile really sold me on this pose too. With the pose figured out, my next big decisions involved sorting out the character and her setting. 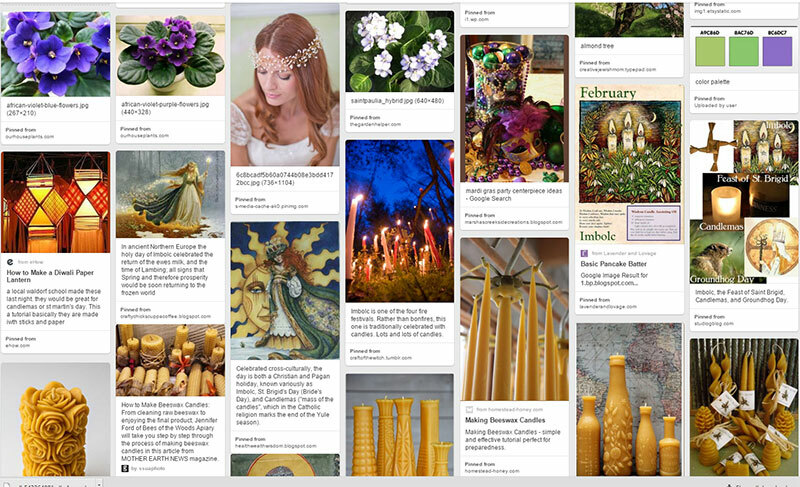 From the start, I knew I wanted to have clootie (hanging prayer cloths), a sacred well, and the beeswax candles, all which harken back to some of the most provocative imagery of February, mainly with saint and goddess Brigid and sacraments of purification involving the beeswax candles. February also clutches an arrow representative of Cupid’s Arrow and the season of love. Pen and marker on a croquis template. With these basic costumes in mind, I blocked them in quickly in Photoshop and also explored more wardrobe combinations by cutting elements from each outfit and combining them. Next, I block in the shape of the flowers at the bottom to make sure they work with the elements of the composition. This also helps me make a final decision about which outfit to go with, since I can see how all the elements work together to fill up the space. I don’t want it to be too busy, which is very easy to do in such a narrow space. The arrangement on the right is my winner because it allows for some of the background elements (ie. the well, more of the candles) to be shown more clearly. With my major design decisions settled, it’s time to move on to refinement! Next: Reference gathering, detail refinement, and color testing! REMINDER! 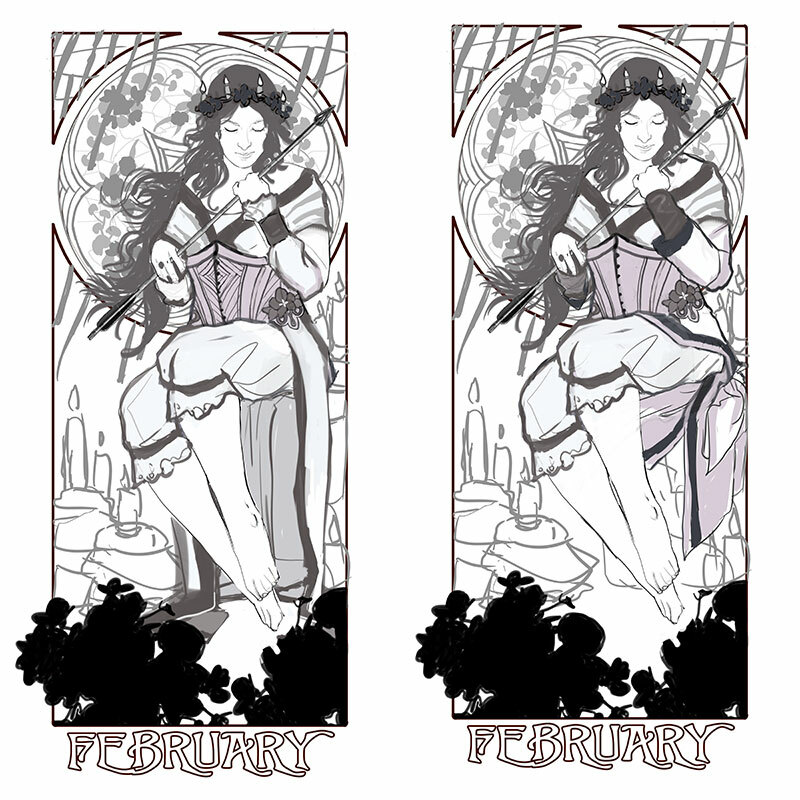 Don’t miss the opportunity to pre-order Limited Edition prints of Lady of February via Patreon! Other Rewards include process tutorials, coloring book pages, etc. Check it out! 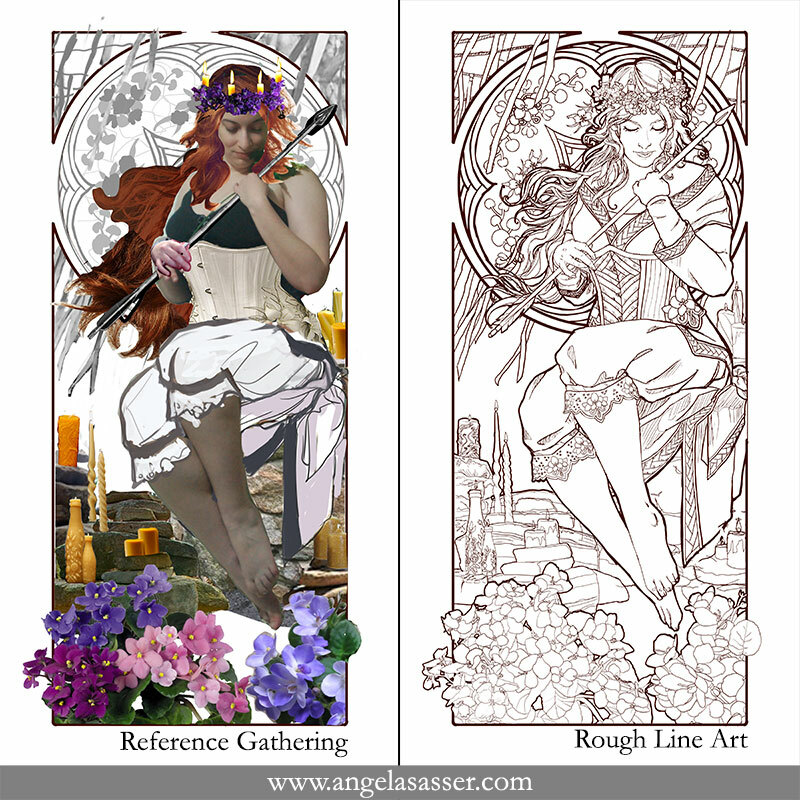 It’s been about a year since I completed Lady of January. A tumultuous 2015 kept me from really indulging in this project, but I’m happy to be back at it full force now that the storm has passed! I always begin the brainstorming for each month by examining the origin of each month’s name. February was named for the Roman festival of purification called Februa. Digging deeper into February revealed even more interesting symbolism with Brigid (both a goddess and a saint) and the martyred Saint Valentine, the namesake of Valentine’s day. I like to jot down my notes and thoughts, along with symbolism in a list that helps my subconscious start absorbing and processing the imagery before I move on to making thumbnails. I also start a mood board on Pinterest, which is a great place for visual meditation on a topic. Instead of typing this out, I like to physical write it out on paper. This helps me retain the information better. An excerpt from my secret Pinterest board for Lady of February. Once I’ve identified the imagery that resonates with me the most, I begin thumbnailing, usually in pencil with ink and white color pencil on toned paper so I can get a basic idea of my value structure and composition from the start. For February, I was very drawn to the imagery of Brigid, especially of the sacred wells and blessing ties (or clootie) that are left around her sites. I also feel that Cupid’s arrow is a strong symbol for this month, but I didn’t want to get too overdone as far as Valentine’s imagery goes. I’ve also filled the background with what will be beeswax candles, which are often utilized in blessings for Candlemas and Imbolc during February. 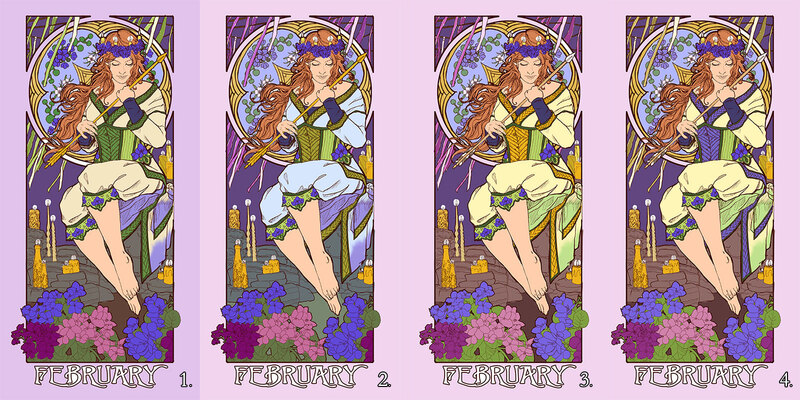 I’ve pictured February with a candle crown similar to Lady of December with the intent to mirror her symbolism, while also harkening back to the flame of Brigid. While Lady of December ushers in Winter, the Lady of January closes the door of Winter and welcomes Spring. I also like the idea that while Lady of December’s crown was metal, January’s will be blooming with flowers. We’ll see what sticks as this image develops, however! It’s a very intuitive process when you’re working with such abstract concepts and themes. The poses that stand out the most for me were 1, 3, and 5, but I still couldn’t make up my mind! To help me out, I take the stock photos I’ve been referencing and, with a bit of photobashing, lay them all out next to one another to see how the poses look on the actual template of the window shapes I’ve already defined. This time, 2 seems the strongest and fits the space well, though she bears a resemblance to January’s pose that might be too strong. I like how assertive this pose feels, while the others like 1 and 4 are more shy and submissive, while 3 is pensive and playful. 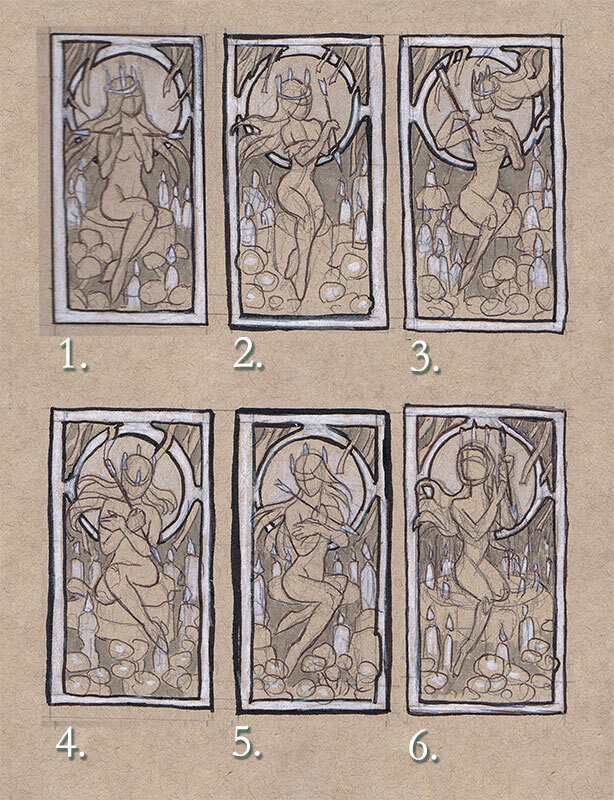 While I ponder on making up my mind about what pose to go with, I at least know that a good majority of the window design will be shown behind the figure instead of covered up (like it was in January with the veil, where I had to make sure the flower designs in the window were on the sides so that they were viewable). Designing a window starts out very rough. I lay in where I want the main foci of the design to be, remembering to keep in mind the shapes of the flowers, like Violets, which bloom in tight bunches with round leaves. I sketch knotwork and design elements loosely, rotating as needed until it hits all the sweet spots. Window #1 hit the right sweet spots, but then the celtic knotwork clashed with the weaving motif I’d been working with based on saint Brigid’s cross. The 2nd design feels more consistent with the interlocking star shape that echoes the woven design. I’ve also arranged the secondary circle of flowers in a way that I feel utilizes the space better. Next: Creating narrative design elements and composition!